Healthy eating is easy when you adopt just a few principles, and even more easy when you try my recipes. For the healthy eating part, eat only organic food at home and eat mostly freshly prepared foods at home. To make your meals taste great, use sea salt and tamari sauce in your cooking. Just follow a few of my recipes and you’ll get the hang of it in no time. You can either follow the recipes that I've posted on this page, or you can go to individual recipe pages via the liks I provide below. 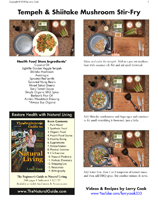 I have 9 videos posted and I offer a downloadable PDF with my recipes, so follow along and start making delicous, healthy recipes! To begin, add the coconut oil to a frying pan on medium heat. Rinse the tempeh under water, and then chop into squares. 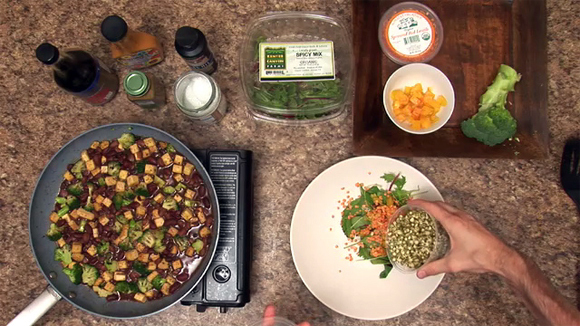 Add the chopped tempeh to the frying pan. Stir the tempeh occasionally while preparing the other ingredients. Wash and chop the asparagus, as well as the kale. When the tempeh is golden brown, stir in the asparagus and fry both for about one minute. Add more coconut oil if needed to keep the mixture from sticking to the pan. After about one minute, add enough water to cover the bottom of the pan, and then add a little tamari sauce as well as a few shakes of the cumin. Bring the mixture to a simmer and stir for 30 seconds. Add the kale, reduce the heat to low, and cover the mixture with a lid. This allows the kale to slowly steam cook. While the food is simmering on low heat, clean the kitchen area and put everything away. After a couple of minutes, place the mixture on a plate and then add the sprouts. Give a good squirt of flax oil to the entire plate of food, and then add the Woodstock Dressing to taste. 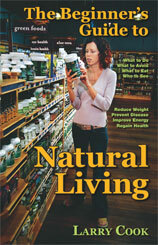 This all-natural wholesome meal is sure to be a winner that will be made on a regular basis. Begin with a pot of filtered water on high heat. While the water is heating, peel, wash and then grate the ginger. Once grated, add the ginger to the water. Peel, wash and then chop the burdock root. Burdock root is a blood purifier that’s very grounding. Add it to the water once it’s been chopped. Allow the water to boil for a few minutes as you wash and cut both the broccoli and the kale. Open the can of chili beans. Add a 1⁄2 can of the chili beans to the soup, and save the other half for future use. Add the broccoli and then bring the soup back to a boil. Once it’s boiling, add the kale and two large scoops of almond butter. Reduce the heat to simmer, and stir the soup to dissolve the almond butter. Once the almond butter is dissolved, add several pieces of dulse seaweed and two or three large heaping tablespoons of the miso paste. Turn off the heat and then stir continuously until the miso paste has completely dissolved. To help the miso dissolve faster, squish it against the side of the pot. Once dissolved, serve the soup and add a good squirt of flax oil. The reason this soups tastes so great is the combination of ginger, almond butter and the red miso paste made by Miso Master. So long as you use these three ingredients, you can use any vegetables you like and also use different beans or lentils and still have an amazingly delicious soup. Fry the organic tofu in coconut oil until it is golden brown. 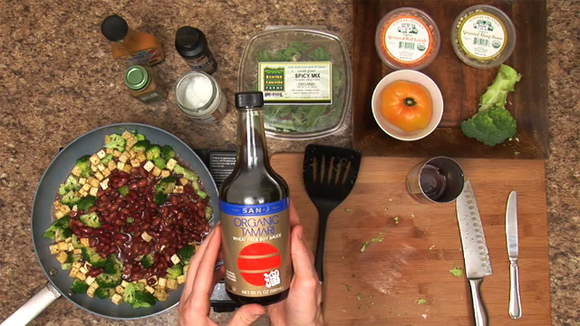 Use organic Tamari Sauce as your "salt" to flavor the food. Works like a charm! Create an organic salad with leafy greens, organic lentils and organic mung beans. To start, add coconut oil to a frying pan on medium heat. Rinse the tofu under water, and then chop it into squares. 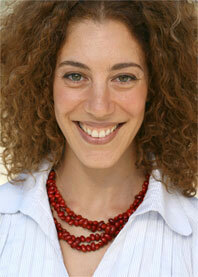 Place the remainder of the tofu into a container of filtered water and store in the refrigerator. 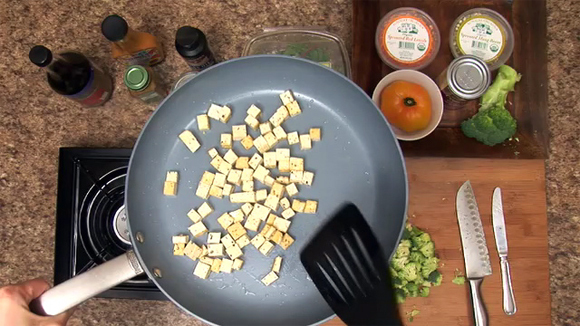 Add the chopped tofu to the frying pan, and then stir the tofu occasionally while preparing the other ingredients. Wash and chop the broccoli, as well as the collard greens. 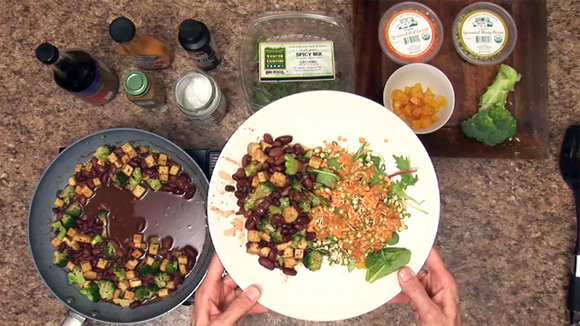 When the tofu is golden brown, add 1⁄2 can of the black beans, and store the remainder in the refrigerator. Add a little water to the mixture and then add some tamari sauce and a few shakes of Mexican seasoning. Bring the mixture to a simmer while stirring. Add the broccoli and then simmer for about one minute. Stir the mixture and then add the collard greens. Immediately place two corn tortillas on top of the collard greens, reduce the heat to low, and cover the mixture with a lid. This allows the collard greens to slowly cook while the tortillas absorb some moisture so that they’re easy to cut with a fork. While the food is slowly cooking, clean the area and put everything away. Place the tortillas on a plate, and then add the rest of the stir-fry to the corn tortillas. Add the sprouted sunflower seeds and then give a good squirt of flax oil to the entire plate of food. The key to this recipe is the tamari sauce, black beans and Mexican seasoning. Feel free to use different vegetables in this recipe because it’s very delicious no matter which ones you choose to use. To begin, add the coconut oil to a frying pan on medium heat. Cut the seitan into squares and then add to the frying pan. Stir the seitan occasionally while preparing the other ingredients. Wash and chop the zucchini, as well as the tomato. When the seitan is golden brown, stir in the zucchini and fry both for about one minute. Add more coconut oil if needed to keep the mixture from sticking to the pan. After about one minute, add a ½ can of the chili beans and a little water. Immediately add some tamari sauce as well as a few shakes of the Mexican spice seasoning. Bring the mixture to a simmer, stir for about one minute, cover, and turn off the heat. In another frying pan, heat the flour tortilla. Once hot, put the tortilla on a plate, scoop the mixture onto the tortilla, and then add the tomato, avocado, sprouts, a squirt of flax oil and some Woodstock dressing to taste. Fold into a burrito or eat open faced. This all-natural, healthy burrito is as delicious as it is easy to make, and is sure to become a favorite recipe. Begin by preparing the avocado. Slice the avocado around the middle and open. Use the knife to remove the pit. Slice into the avocado to create several sections. Slice the tomato into several pieces and then cut each slice into halves. Toast the bread and then spread some Buttery Spread on both slices. Next, spread Vegenaise on both slices of the toast. Use a spoon to scoop the avocado slices onto the toast. Add the tomato slices, Tofurky, and a heaping pile of sprouts. Close the sandwich, and enjoy. This delicious and nutritious vegetarian sandwich can be configured in a variety of ways. For example, you can use leaf lettuce instead of sprouts, hummus instead of tomato, and even sprouted red lentils instead of avocado. When you need to make a quick meal, the vegetarian deli slice sandwich is a healthy option that always tastes great. Begin by adding the coconut oil to a frying pan on medium heat. Add the veggie burger to the frying pan and flip it occasionally as it heats up. Next, prepare the avocado. Slice the avocado around the middle and open. Use the knife to remove the pit. Slice into the avocado to create several sections. Slice the tomato into several pieces and then cut each slice into halves. Toast the bread and then spread some Buttery Spread on both slices. Next, spread Vegenaise on both slices of the toast. Use a spoon to scoop the avocado slices onto the toast. Add the tomato slices, the heated veggie burger, and a heaping pile of sprouts. Close the sandwich, and enjoy. 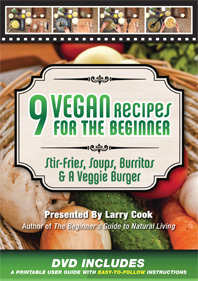 This delicious and nutritious veggie burger can be configured in a variety of ways. For example, you can use leaf lettuce instead of sprouts, hummus instead of tomato, and even sprouted red lentils instead of avocado. When you need to make a quick meal, the veggie burger is a healthy meal that always tastes great. 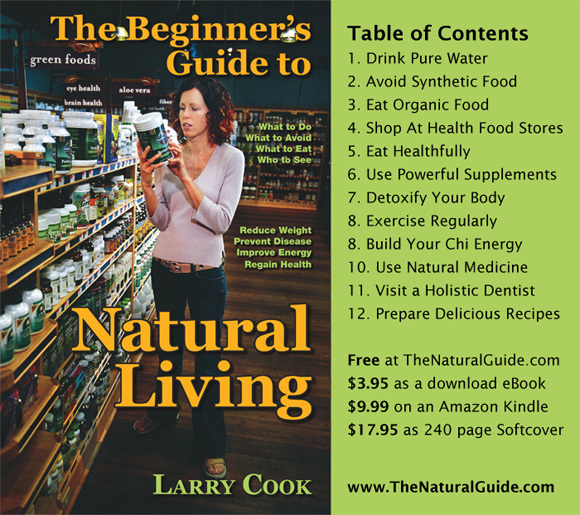 To watch all of my healthy recipe videos, please visit my YouTube Channel at http://www.youtube.com/user/LarryCook333.